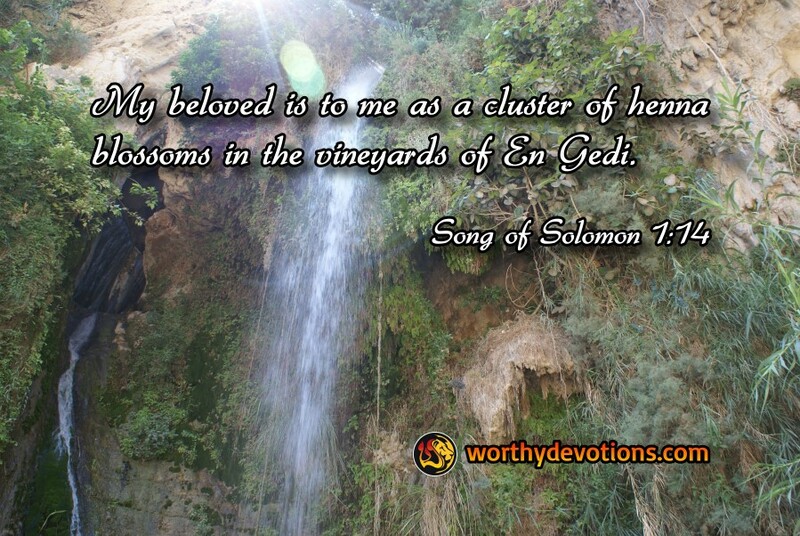 Song of Solomon 1:14 My beloved is to me as a cluster of henna blossoms in the vineyards of En Gedi. In the Song of Solomon, the King likens his beloved to flowers in the desert, his experience of En Gedi, evoking the dramatic contrast between a harsh and arid landscape and the exquisite refreshing floral beauty of an oasis. Such was Solomon's experience of romantic love, perhaps with the Queen of Sheba. Seek the Lord your God. His Presence is an eternal spring and a perpetual oasis in this arid world, and His love is better than the most desirable romantic experience you could hope for. It's a love which flows from an eternal spring, Yeshua (Jesus), Himself, and its sweetness and power will cause flowers to bloom throughout your dry and barren life. Drink from the spring of life, your beloved, Yeshua – He will fill you to overflowing, and make you, yourself, a living spring...for this thirsty, love-starved world. The fields are white in the world!